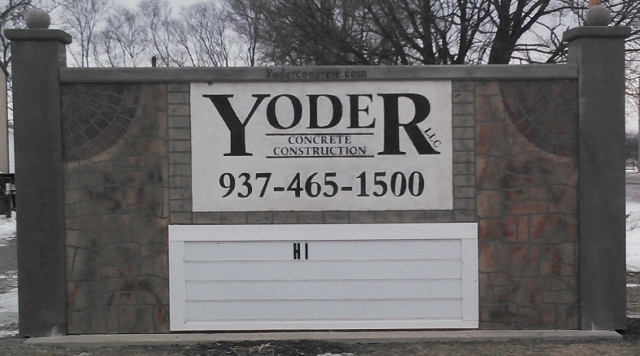 Established in 1991, Yoder Concrete Construction, LLC is a reputable concrete company with over 20 years' worth of industry know-how and experience. As ACI Certified Finishers and a BBB Accredited Business, our goal is to provide quality craftsmanship alongside dedicated customer service. When you need highly trained concrete professionals in Bellefontaine Ohio, Urbana Ohio and any of the surrounding areas in West Central Ohio to expertly complete your project, contact us for competent service at a reasonable price. Whether you're in need of concrete construction for your home or business, you can trust the expertise, cleanliness, and attentiveness our technicians provide. We provide services that include concrete paving and floor construction, foundations, footings, foundation, retaining and stem walls, driveways, patios, sidewalks, decorative concrete, and more. As one of the most experienced concrete contractors serving West Central Ohio, Yoder Concrete Construction works to meet the specifications and budgets of clients for new home construction, enhancing the appearance existing homes, barn floors, garage floors and more! We also work with general contractors in the construction of new commercial buildings, by providing concrete work for foundations, interior floors and exterior structural elements. Our concrete services extend to clients looking to complete industrial or agribusiness-related construction projects. From demolition and removal, to grain bin foundations, containment pits and trench drains, to docks and equipment and machine bases, Yoder Concrete Construction is capable of delivering an assortment of construction services. We employ professional technicians, able to complete projects under strict time constraints without sacrificing quality or safety. In addition to providing industrial, commercial, and residential concrete services, we also complete projects for public works, municipal, and government entities. Unlike many other concrete companies, the results we produce for our clients speak for themselves. We provide construction services using a combination of education, training, and the expertise and experience of an in-house group of specialists in their trade. We are City of Dayton WBE/SBE, State of Ohio EDGE and Federal DBE certified construction firm that is also A+ rated with the Better Business Bureau. As a drug free workplace, safety is top priority in all we do. All of our employees undergo an extensive safety program and we possess a low EM (Experience Modifier). Bonding is available on an as needed basis. To obtain a quote for your project, or for more information about our services, give us a call today at (937) 465-1500 or (866) 466-8614. "This was a big project. It was completed in a timely and professional manner. Thanks for being the best at what you do." Justin Weller - Maple Lane Cattle Co.
Visit our Blog to find out about current projects, obtain helpful concrete related tips and advice, and just to learn more about Yoder Concrete Construction, LLC. Let us know what you think! Contact us for a quote or to answer your concrete related questions.